SJVN LIMITED is looking to recruit fresher Indian candidates for various job profiles which are currently vacant in various centers. SJVN is one of the Mini Ratna Schedule ‘A’ Public Sector Undertaking organization under Government of India. 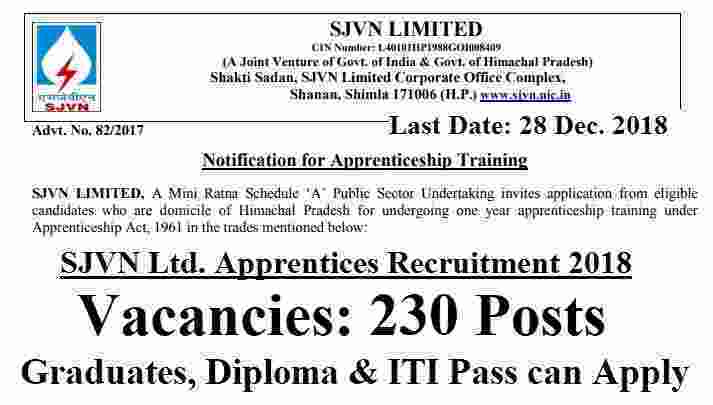 There are total 230 vacancies which are going to be filled up through this SVJN Recruitment procedure. Graduates, Diploma and ITI Certificate holder can apply for these Government jobs in HP state. SJVN Recruitment department invites job application from all qualified applicants who are looking for the Government jobs in Himachal Pradesh 2019. 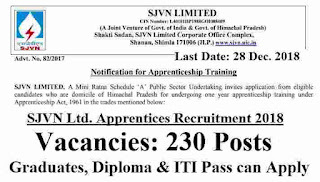 Only those applicants are eligible for applying this SJVN Recruitment process who have a domicile of Himachal Pradesh for undergoing one year apprenticeship training under Apprenticeship Act, 1961 in the trades mentioned below in this article. We advise all applicants to read the whole article carefully before applying for these Govt jobs in HP. We try to explain each and every prospective related to these Government jobs below in this article. Total Number of vacancies which are going to be fill up through this recruitment process are 230 Posts. During the Training Period various Pay Scales are paid to the various Job profiles. Graduates Apprentices will get Rs.10,000 per Month, while the Diploma Apprentices will get Rs.8000 and the ITI Apprentices will get Rs.7000 per Month during their Training period. In the Table below we are going to explain the vacancies information according to the various stream and Discipline. Check the table carefully for more information related to the stream wise vacancies which are going to be filled up through this SJVN Recruitment 2019. Graduation degree in Engineering / Technology in a relevant stream can apply for these job profiles. Having a full time diploma in Engineering/ Technology in the relevant stream can apply for these job profiles under this SJVN Recruitment . Those who completed their ITI course after the completion of 12th class can apply for these job profile (or) 12th pass and have completed their Vocational Course in relevant Branch /Trade. Age Bond: Applicates age must be in between 18 years to 30 years for applying any of the job profiles. Those who fit in this age criteria can apply for these Government jobs in HP. What is the Application Fee for applying this SJVN Recruitment? Paying Method: You can use one of the following method for the payment of the application fee: “Debit Card, Credit Card, Net Banking or Pay Offline Through E Challan”. You can choose any one of these which suits you the best for the payment of the exam fee. 4TH Dec. 2018 is the Opening Date to apply.